My parents were coming over for lunch and I wanted to make them something super tasty that they wouldn't walk away wanting more ... or wanting meat. I'm in my thirties and I don't know why, but I still want to impress my parents and get that 'good job, pat on the back' from them. Does that ever go away? As they have eaten my food a lot, we are big munchers, so I am usually making appetizers and not a meal. 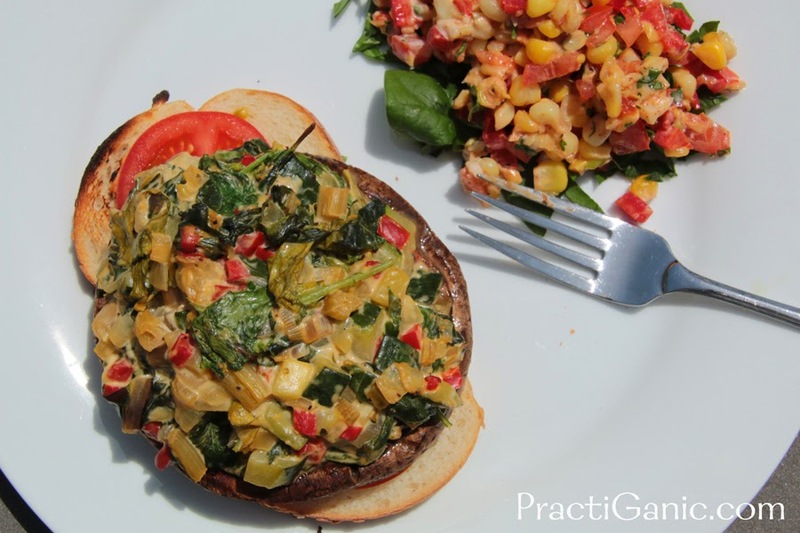 I was thinking about what to make all week and I kept coming back to the stuffed mushroom. I know people who don't even like mushrooms that will eat these because there is so much flavor going on other than just the mushroom. 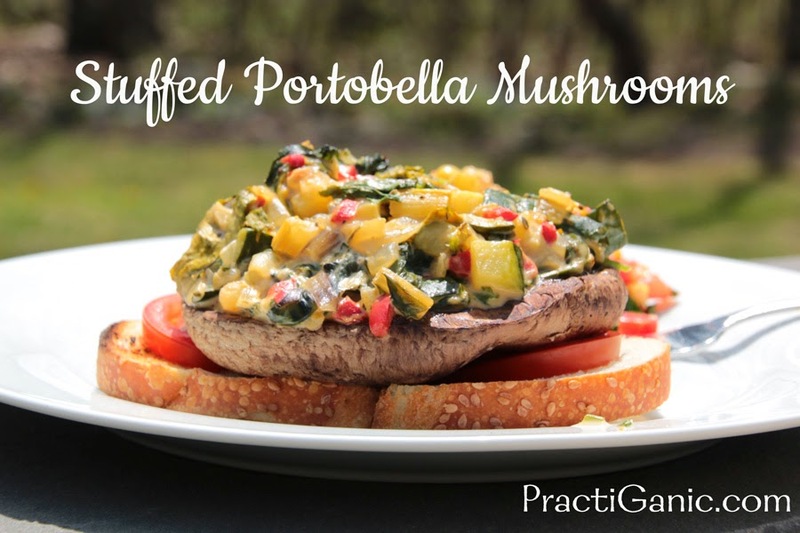 There's only about a million stuffed portobella mushroom recipes out there. You can stuff them with anything. You can bake them, grill them, fry them ... it's endless! However, I always make come back to this recipe. I love that they are just filled with lots of tasty veggies and the cheese is just there to hold it all together but not take over the taste. A perfect anytime food! And my parents were very happy with their lunch, walking away full and satisfied! 1 bunch of chard, stems diced and leaves are julienned. I like rainbow chard the best ... it's so pretty! Bake mushrooms for about 10 minutes, flipping them halfway through. Keep a close eye, since the size of mushrooms can vary and some may be done earlier and others will need more time. They should start to look a little wilted around the edges. Remove them from the pan and discard the liquid. Meanwhile sauté garlic, mushroom stems, chard stems, onion, red pepper and zucchini about 5-6 minutes or until onions are beginning to get translucent and the liquid is gone. Add in your chard and spinach leaves a little at a time so they can fit in your pan. Cook until they are nicely wilted and liquid is gone. Mix in your cream cheese, salt, pepper and italian seasoning. Divide the filling equally amongst your 4 mushroom caps. I like to bake them for another 5 minutes but you could serve them right away too. Serve it on a piece of toast, a bed of greens or just by themselves.